Today has been a very moving and rewarding day, I must say. Today was the Susan G Komen, Central New Mexico Affiliate Race for the Cure. I was one of the official photographers. I called my friend last night, who happens to be the Executive Director of the CNM Komen foundation, and asked if she still need/wanted some one to take pictures. So she said, of course. So I showed up there around at Balloon Park around 5:50am), got parked in the volunteer parking and found my Paula. I picked up my offical badge to tell that I am one of the official photo people for the event. So not long after I got there, Kelly showed up. Kelly is a good friend who was also going to be one of the official photographers. So at first Kelly and I say together as we both had gotten there early, and there was not much going on yet. But once the event really got started, Kelly and I split up and covered much ground. This was my first time attending one of the Race for the Cure events, and I must say they are very emotional. 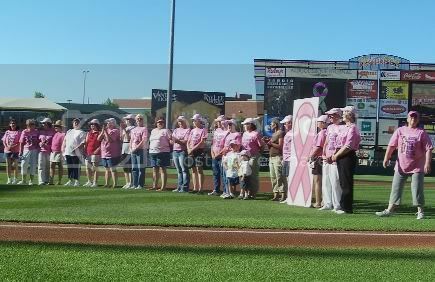 There is a thing called "The Pink Parade", and basically all Breast Cancer Survivors get pink shirts, and there is a parade, and the survivors end up on stage, and the co-survivors (people whom have help them through the fight), are standing in front of the stage. Its amazing to see all these women (and men too) who are either fighting, or have won the fight against breast cancer. I also learned some new lingo today. Like the major question that all the women in pink asked the other women were "How long have you been a survivor? ", and hearing some of the responses was truly amazing. I heard one woman say that she had just be diagnosed with it, and is due to go in for surgery on Tuesday. I think that one hit me really hard that this is not just a race for the people who have not made it, or the ones that have made it. But its also a race for the people whom are fighting the fight. It’s also much different to put faces to this, then to just hear about it on the news or other places. One funny note from today is that I swore no one was in church, as half if not more of our church had to be at the event today. I saw so many people from my church there its not even funny. So that was funny to talk to Kelly about (who also is my pastors wife), about how Erik (my pastor) was going to have no one in church today). LOL. Also as another side note, I think this is the most I have walked / ran since I did my ankle in back in February. So when I got home around noon, I could really feel my ankle hurting (and no, not like I hurt it again), so I used my air cast for a bit this afternoon). One of the best things about being one of the official photo people, is that I had complete unrestricted access at the event. That means I could be on stage, I could be where ever, for what ever reason. It’s kind of a feeling of power, but at the same time not really. LOL. So after all the races were done, I stayed around to help clean up, cus well I am just that type of person. Anyway, one of the major sponsors is the local metro Ford dealerships. So I got to drive around the Balloon Park as we cleaned up, and picked up stuff in a very nice Ford F-350 King Ranch edition truck valued at well over 50,000 dollars. Let me say that I love turbo diesel. LOL. That thing had some major power to it, and was really freaking fun to drive. But as with all good things, it did have to come to an end. My wheels got repo'ed. LOL. Ok, it had to go back to the dealer lot, but still. I must admit I was a little sad to see her go. LOL. 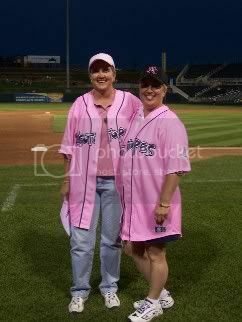 So also tonight was an Isotopes game (our local AAA baseball team) and it was Breast Cancer Awareness night. So I got to the field around 4:30pm, for a 6:05 game start. We also got in before everyone else so we could setup what we needed to and other stuff. Right before the game started the Isotopes brought out a bunch of the survivors who were also at the game to be recognized. Also one of the survivors to throw out the first pitch, and she did a damn good job too. Again I was taking pictures for the Komen Foundation, so I was out on the field, with the stands full, taking pictures and stuff. It’s such a freaking cool feeling, not that my ego need's it or anything. But still really cool! Also the Isotopes were doing what is called a "Shirt off the back auction". 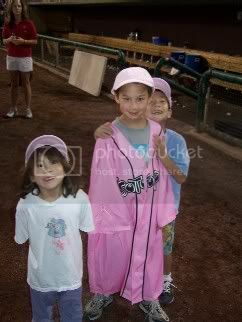 The Isotopes had pink uniforms made up that each player wore during the game. At the same time the game was going on, there was an auction for them. Who ever was the highest bidder for each uniform won it. At the end of the game, we all go back on the field, where the player's were giving the uniforms to the people who won them, and also autographing them too (if they wanted). So again more photos. I was not able to be in the sky-box / vip-box as there was a mix-up in the tickets but, no matter as I got a good seat in the stands, and was able to sit with a bunch of the survivors and people who were at the race. It was also such a nice night too. I really enjoyed my self at the baseball game, and think I might have to go more often. If anyone is interested in going, get in touch with me, and we shall figure out a time to go. So if you click on the link below, there will be 4 of the photos from the baseball game. I have many more photos (I think I took over 300 today alone), but right now, I only have the energy to pull out 4 or so. So I hope you enjoy them. So its been a very moving and busy day. I think I am ready for bed, but I am not sure I want to get up in the morning. LOL. Also sorry about this being a really freaking long post, but this is something I had to write about. Current Mood: accomplished and amazed! i'm super proud of you! i'm glad you had fun,also. Buddy, you are amazing. I certainly won the lottery the day God gave my beautiful son to me. I hope that you always know that I am proud of you every second of every day, but days like this are just the icing on the cake. I love you so much, and I'm so proud of you. What a wonderful man you are! you're not my baby, but i 2nd your mom. i won the lottery having a cousin and person in my family who is as sweet and such a good example as you are.